The US Supreme Court sees 7-8000 petitions of writ a year. These are requests to have the US Supreme Court hear oral arguments regarding a case that could set a new precedent or the courts below are split on the decision. Only 80 cases are heard each year by the US Supreme Court. Attorney Seth Kretzer had the rare opportunity to argue before the highest court in April of 2017. Below are the details of the case. 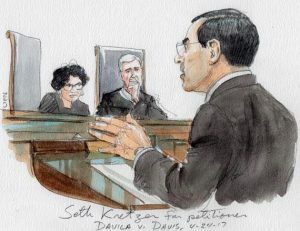 The Law Offices of Seth Kretzer is proud to announce that Mr. Kretzer presented oral arguments before the Supreme Court of the United States on April 24, 2017 in the case of Davila v. Davis; Docket Number 16-6219. Very few cases in the Supreme Court are ever set for hearing. Last year, the Supreme Court received 7,654 appeals and granted 63 for oral argument; this is a rate of .862%. But an inmate on Texas’s death row named Erick Davila had the first-ever hearing on his federal writ in the Supreme Court. By way of background, Erick Davila received the death penalty for the 2008 shooting deaths of a grandmother and her 5-year-old granddaughter. Davila, a gang member, drove to a house where he knew rival gang member Jerry Stevenson was and shot into the house and front porch. Instead of killing Stevenson, Davila killed Stevenson’s daughter and mother. During his trial, defense attorneys said Davila didn’t intend to kill multiple people, only Jerry Stevenson, thus making the case ineligible for a capital murder conviction and the death penalty. To be convicted of capital murder in this case, Davila must have knowingly and intentionally killed multiple people. The court sent legal definitions and included a charge that said Davila would be responsible for a crime if the only difference between what happened and what he wanted was that a different person was hurt. The defense objected, saying it was an improper jury instruction, but the court overruled the objection. Within an hour, the jury came back with a capital murder conviction, later sentencing Davila to death. The crux of Davila’s current legal argument rests on this jury instruction and how his subsequent appellate lawyers dealt with it. The state’s brief declared that Davila’s arguments are meritless, that a federal district court reviewed the jury instruction in question and found no fault against it. Death row inmates can also appeal their cases in the federal courts system, but it is generally ruled that issues that could be raised at the state level — like the jury instruction — can’t be reviewed at the federal level until they have gone through the state courts. One exception to this rule is if the state habeas lawyers failed to raise the issue of ineffective trial counsel. Kretzer argued that this exception should also apply to state habeas lawyers who fail to raise the issue of ineffective appellate counsel as well. “The way the law works right now is if the trial counsel made a mistake, the federal court could save the inmate’s life, but if the appellate counsel made the mistake, they would have to go ahead and execute,” Kretzer said. 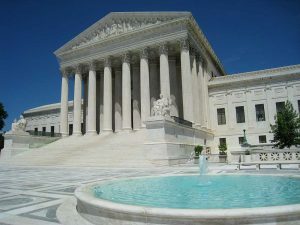 The Supreme Court agreed to review this case because different federal appeals courts have ruled differently on the distinction between ineffective trial counsel and appellate counsel. In previous rulings, the 9th Circuit Court of Appeals has said that there is no distinction between the two, but the 5th Circuit, which covers Texas, as well as the 6th, 7th, 8th and 10th circuit courts, have all ruled that the two shouldn’t be treated the same. In short, the Supreme Court stepped in to straighten-out a national split so that a habeas petition does not face one set of rules on the West Coast but a different set of rules everywhere else. Mr. Kretzer has argued dozens of criminal appeals in courts across the country; the honor of arguing Mr. Davila’s case is the highest, but only the most recent, point in this firm’s long tradition of providing skilled and aggressive legal advocacy to Texans facing life-endangering convictions and sentences, along with appellate and habeas attacks when such convictions and sentences contain legal error. In July the case was “Affirmed” with a 5-4 split. The opinion was delivered by Thomas, J., in which Roberts, C. J., and Kennedy, Alito, and Gorsuch, JJ., joined. The judges who gave dissenting opnions were Breyer, J., Ginsburg, Sotomayor, and Kagan, JJ. The Houston Chronicle has written an article on Davila v. Davis. Click here to read the text. The Fort Worth Star Telegram has written an article on Davila v. Davis. Click here to read the text. The Texas Tribune wrote an article on Davila v. Davis days before the defendants appearance in court. Click here to read the text. Click here to view updates about Davila v. Davis on SCOTUSblog. Click here to view the Petition for Writ of Certiorari for Davila v. Davis. Click here to view the Brief in Opposition to the Petition for Writ of Certiorari for Davila v. Davis. 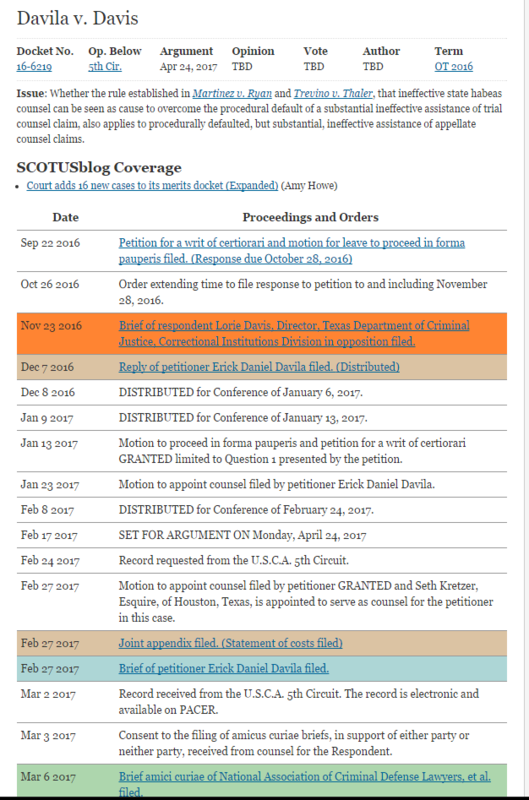 Click here to view a timeline of Davila v. Davis. Click here to view the Reply Brief for Davila v. Davis. Click Here for Trial Transcript.